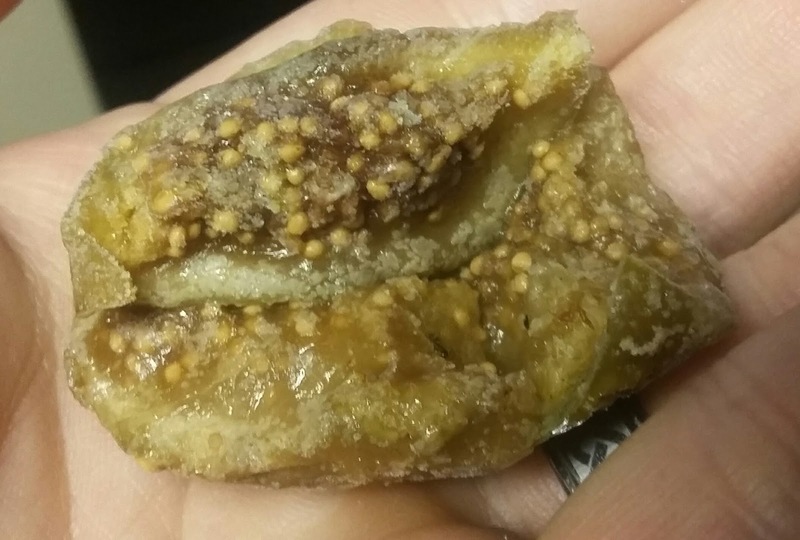 There's really not a whole lot to Trader Joe's Semi-Dried Green Figs. Nothing added or subtracted, but simply a fig, partially dried, and frozen. That's it. That could be the end of the review pretty much right there. But that's not how we roll...because while they do "taste...similar to fresh fruit" they do feel a little different. Had to leave out the "amazingly" because that's a bit too strong of a statement. Anyways, if you're already familiar with their tried and true semi-dried formula first tested out on apricots, you can expect something similar here. Those particular fruity tidbits have become a family snacktime favorite around here for 75% of our clan - I don't care about them one way or another, but Sandy, and particularly the kids, can polish off a bag for lunch. In fact, it was those apricots we were looking for when we found the figs and figured to assess them instead. For taste...yes, a fig. What we you expecting, a rutabaga? Tastes like a fig. The feel, though? I'm a dried fig aficianado - everytime we go to Costco I need to get me a bag, it lasts me maybe 10 days. 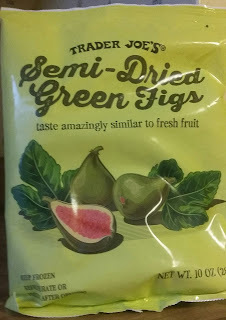 I'd say these are much more similar to fresh figs, except I had those recently...too soft, too fleshy, too wiggly, too...I don't even know the word. That was another Costco purchase, and we made our way through the Montana-sized package, but with much less gusto. So I guess these fall fairly squarely in the middle. There's not the tough, chewy, fibrous bite of dried, but not the super soft mouthfeel of fresh. The seeds maintain their crispy qualities as well for a nice textural variant. Sandy prefers these semi-dried guys straight from the freezer, because she's a little odd, but even when thawed a bit they retain a lot of their middlin' qualities. The kids seem to like them to, maybe not as much as the apricots, but their little chompers have less work to do than with dried, and I couldn't get them (or Sandy) to eat their fair share of fresh. Not a bad purchase for $2.99, we bought two bags and will happily finish them and likely go back for more. Maybe make a tart or fig butter. I really love these in a basic smoothie with plain yogurt, a bit of honey and almond butter. Unknown: you've got my taste buds going. I like your ideas.